More than just a smoothie! I met Matthew sometime last year, when he was working at The Local, a juice shop on Main St. I then met him again when he moved to start the Real Roots Cafe in Fort Oglethorpe, Georgia. He seems the epitome of a small business restaurant owner--in a good way. He's engaging, smart, ready to do what it takes for the job and has the good looks too! Matthew and his wife are doing an amazing job running the cafe, read on for more about them! 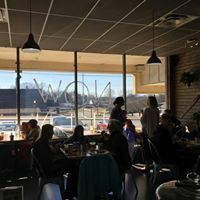 When did you start Real Roots Cafe, and why? We started Real Roots the summer of 2013. My wife and I both left corporate jobs that we were unhappy in. We decided to make smoothies under Real Roots name and travel to various farmers markets around the area. We were at 4 farmers markets a week all summer. We eventually met the owner of Local Juice (downtown Chatt) and we quickly joined his team as he was working to get Local Juice open. We officially opened Real Roots cafe in September 2017. Have you always been in the healthy food movement and vegan? What’s your passion and drive to get up and go to work (or stay at home, depending on your definition of “work”) when it’s really hard? We love creativity, food, and running a business. If you work in the food industry, you know it can get crazy busy and crazy stressful at times, but all the "that's amazing" or "thats sooo good" make it all worth it. Plus working for yourself and planning out how YOU things want things done really drive us. We see things that inspire us or give us passion and we go for it. Some weeks we are exhausted, but the drive never fades...we WANT to do this. Also, we have learned patience is a virtue, but you must be willing to act and execute as well. Have you always been a local to Chattanooga? I moved to Chattanooga when I was 13 and went to Notre Dame High School before attending and graduating from UT Knoxville. Tiffany has lived in Hixson her whole live where she attended Hixson High School before attending and graduation from Chattanooga State College. I was a Project Manager at Unum in the Voluntary Benefits department for 7 years. After that, I was the general Manager at Local Juice for 3.5 years and Tiffany was the chef and kitchen manager for 2.5 years. Tiffany worked at Suntrust for 2 years before her position at Local Juice. What is your favorite smoothie or juice that you serve? My favorite juice is the Let's Kick It, which is orange, pineapple, carrot, and ginger. My favorite smoothie is the Rio Santo, which is banana, spinach, coconut, peanut butter, and raw cacao (chocolate). Tiffany's favorite juice is the Dope Beets, which is beets, watermelon, mint, and lemon. Her favorite smoothie is the Need Protein, which is banana, strawberry, dates, hemp and chia seeds, spirulina, nut butter, plant protein, and almond milk. Our favorite bowl we serve (like sorbet) is The Peak, which is frozen mango, banana, and peanut butter blended with almond milk...then topped with granola, hemp seeds, and fresh banana. If you could see yourself in 10 years what would it look like, or what’s your vision for Real Roots Cafe? With meal prep launching, we want to create something that hasn't been done in Chattanooga. We want to be a full service custom meal prep with full delivery to service the entire Chattanooga area. We hope to have other locations in the surrounding areas as well and may look to expand to other cities. And lastly what are some of the ways the community has changed you to better yourself and supported you? The community is our backbone here. We have so many regulars and people that are spreading the word for us and getting involved in our cafe. We honestly work harder the more we hear things from locals...it makes our hearts so happy and is the greatest driver of our hard work and passion. We hope to continue to help the community get healthier as they help us grow. Newer PostI didn't think I could do this!